Yes, chickens today are in fact bigger! As the demand for chicken as a protein has increased, farmers have worked to create larger and healthier chickens – to meet that demand over the past few decades. In the 1920’s, the average chicken at market weight was 2.5 pounds and the U.S. population to feed was 115 million. Today, through improvements in breeding, nutrition, veterinary care and bird health, chickens have healthier organs and stronger limbs. All of these improvements mean farmers are able to raise bigger and healthier birds to feed today’s growing U.S. population of approximately 320 million. 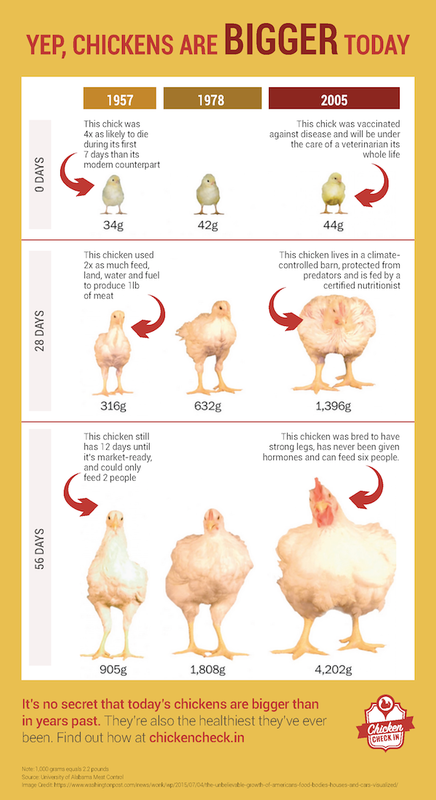 This infographic explains chicken growth over time as a result of modern breeding, better living conditions and daily care by dedicated farmers. Learn more about how today’s chickens are bred to be bigger and healthier than ever before in our FAQ section.